After the outstanding success of 'Book2Look', WITS Interactive and Quinto unitedly worked for another venture - Flipintu. The aim was to create a single platform for the varied online reading needs of viewers. This website would have to be made adaptable and easily accessible across all operating systems and reader devices. Flipintu is an innovative web based platform for digital content and will work as an interactive, social, digital magazine, adaptable to all devices. It is the new way of reading Books, eBooks, Magazine articles, Reviews and other interesting stuff from the Flipintu community. 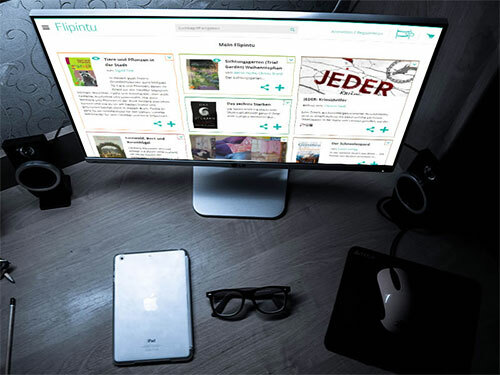 Flipintu is all about Discovery - you can explore editorial articles to community recommendations to special interest channels or suggestions based on your reading patterns. Flipintu not only supports online but also offline Reading on all major platforms (Web browsers, Smartphone's and Tablets). If you buy an eBook via Flipintu, you can also read it on your favorite eReader app. The idea behind creating the Web App was to provide the users with a totally different experience. Hence, the 'Discover. Read. Share' concept works well for Flipintu. With Flipintu, everyone who writes or wants to write can put in their thoughts or a blog, thus widening their audience base.